With all the excitement over other people’s cool careers exploring space, my research has taken a back seat for a while (at least, in terms of blogging)! A recent NASA video, however, reminded me of its importance. Why do we explore icy worlds? These days, a planetary scientist can barely walk down the celestial street without tripping over a new planet. And why not? Our Solar System, one star among “billions and billions,” has eight (R.I.P., Pluto). According to a quick Google search, there are an estimated 100 billion galaxies in the observable universe, and our own Milky Way Galaxy (for example) has an estimated 300 billion stars. Simply multiplying that out gives 30,000,000,000,000,000,000,000 stars in the observable universe. Holy moley Batman, that’s a lot of stars! Even if only a fraction of those stars hosts planets, there are still going to be billions, if not trillions, of other worlds. Not all of those are going to be observable from Earth, but it’s no wonder planetary scientists actually sign up to get Tweets about new planets (yes, those are a thing)! How is this relevant to icy worlds? Well, if you want to know whether any of those planets could harbor life, you must further limit your search to planets in the “habitable zone.” Sometimes called the “Goldilocks zone,” this is the region around a star where the conditions are just right to support life; where the essentials – mainly, energy – are abundant enough to support organisms. And this is where icy worlds come in. Scientists used to think that the main “ingredient for life” was a warm, wet surface; that organisms needed both liquid water and sunlight (an endless source of energy) to survive. 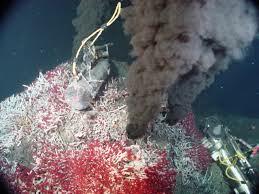 We’ve since learned that life has an incredible ability to thrive in seemingly appalling environments, like hydrothermal vents at the bottom of the sea. Crucial to understanding the possibilities for life on Europa is knowing how (or even if) the liquid ocean has indeed been liquid since the birth of the Solar System. Tidal heating, the process I study in the lab, is one of the primary ways of generating heat within an icy moon and keeping that ocean liquid! So in a way, the hunt for the physics of tidal dissipation is helping us understand the possibilities for life elsewhere in the Universe. So interesting. The life that thrives on other planets may look nothing like life on ours, but it doesn’t necessarily make them any less intelligent, just a different species with a different method of communication. I’ll definitely have to sign up for the “New Planet” Tweets!